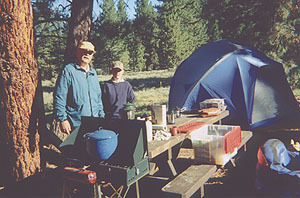 Seven of us went to Davis Lake for this year�s fishout. We fished in three, largely independent, groups that met only for dinner at the Old Log Inn at Portola. Dave Harris and I fished together one day and separately the next. We pursued the trout aggressively, searching for fish from one cove to another with a portable fish finder. We found the most accommodating trout on underwater ledges and drop-offs, in about 8 feet of water. Using intermediate lines we each caught 15-25 fish a day. 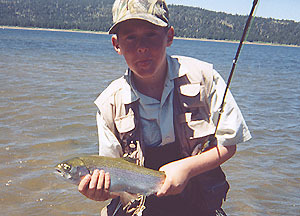 I am not sure that we were catching trout that were keying on the damsel hatch. This technique, however, should be productive throughout the year, regardless of hatches. Richard Holubek, Ken and Alex Tetzel formed a second group that had remarkable fishing. Early on they abandoned their boat and float tubes and started to wade the points and promontories. These strategic areas had the most intense hatches as damsel nymphs converged on them from all directions. Large, powerful trout patrolled these banks in shallow water, erupting on the hapless insects just as they were reaching the safety of the shoreline. Richard Holubek had a marvelous time sight fishing in knee deep water for these behemoths. The runs were so powerful that he couldn�t hold them with 5X tippets. Ken Tetzel actually broke off trout with 2X! How big were they? The biggest fish Richard landed was estimated at 24 inches ("from the tip of the landing net to the S on the ORVIS sign on the handle") and he lost a fish considerably larger. These were not the lazy fat trout you find on some of the private water we have been recently fishing. These were high-calorie fed trout that ran like bonefish and broke you off in the weeds. The third group of fly fishers, R. Catanzaro and Phil Drees, met the son the Jay Faire at a supermarket in Portola who offered to guide them on Sunday. Under his tutelage our two members caught fish at Mosquito Slough and Freeman Cove. 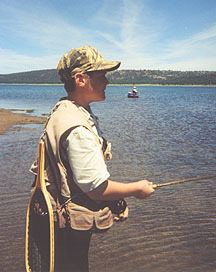 Lake Davis is a great fishery that is no secret to California anglers. In addition to a $30,000 fishing derby, three flyfishing clubs had fishouts during our weekend. Ken Tetzel remarked that he found the lake to fish peculiarly. Although there are 20+ inch fish slashing at bugs within a rod length of your float tube you often can�t seem to get them to take anything. It�s very frustrating and very challenging at the same time. If you did everything right you were rewarded with a remarkable fish. Those who tasted the sweet fruit of success are already looking forward to next year�s trip. Those who didn�t - don�t give up!